What is it, a smart and insightful friend asked recently, with blogging? He was, I believe, sniffing out some of the less savory dynamics that seem almost inevitably to accompany blogs, and the writing of them. An attachment grows. The checking of stats becomes compulsive. Readers can feel a growing love of the sound of the keys clicking out the writer’s opinions far and wide. And bloggers can grow harsh and fractious, which is to say, boring. Now, with the unexpected departure of one of the best practitioners of the form, more than one commentator has declared the blog dead. Well, yes. And, maybe, no. 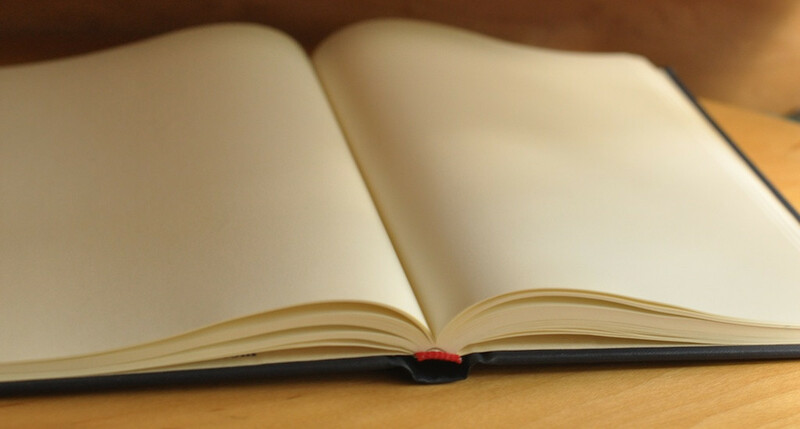 To put down that first mark on those crisp, clean pages, though, was difficult. I still have the book, and there is not a mark in it. It is many years later. The Internet is not so beautiful and pristine. It is crowded, jumbled, very loud. Somehow, though, that is just what makes it possible for me to carve out a space. I thought that maybe now, I would write a few pages. I do not check the stats on this blog. It is an offering. Take whatever you can, and, if you comment, or let me privately about some benefit to you, that will just be icing on the cake. The way of Mary, as we’ve seen, sometimes requires action, action that is simultaneously careful and daring, taken at just the right moment. Following in this way can never, though, be reduced to action. It can never be simply a matter of effort. There is a wordless agreement in the exchange that follows, an agreement beneath an exchange that seems initially to be disagreement. (And if that algorithm is a confusing one, well, it’s also one that will be immediately familiar to any mother of an adult child). In his initial response, Jesus seems to demur, and certainly gives no guarantee that he will act: “Woman, how does your concern affect me? My hour has not yet come.” For her part, she does not press him, but even without any guarantee, she reaffirms the sense of having committed the matter to him. Indeed, she draws others into this act of handing-over: “His mother said to the servers, ‘Do whatever he tells you.’” And Jesus, too, in the end, does respond. For us, the analogous action of committal is prayer, and this, I would argue, is the single most foundational practice of a Marian way. Our first task is an explicit, conscious committal of the difficult or dangerous situation we face to the Lord. And we, too, are called to refer the matter to God in the way Mary does, through Christ. This may be an individual action as was Mary’s, or it may be communal, in a way that returns us to the pattern of the Visitation. Every “prayer service for peace” is a form of this referral, but in a sense, every prayer and all prayer is, too. The great prayer of the Eucharist gathers up every act of committing-to-God. We do not dictate a plan of action, and we are not answered with any guarantee. We simply begin by acknowledging where the ultimate source of power to resolve the problem lies. Like the servants in this account, we may well be called by God into a second form of action. 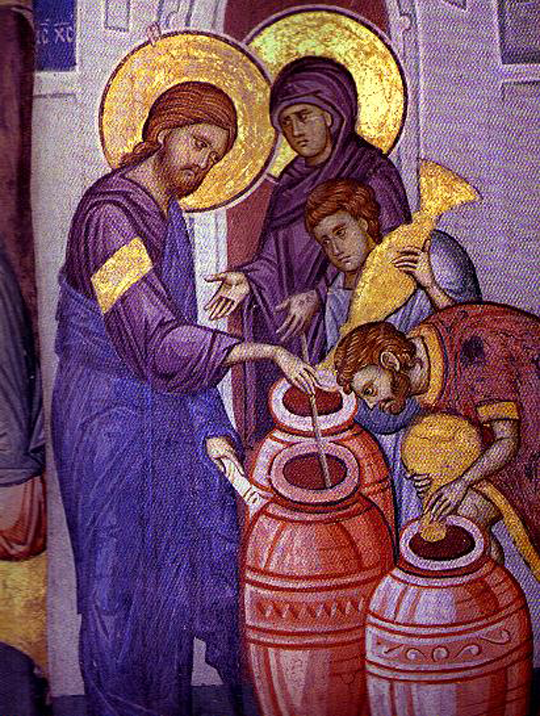 It is, after all, only as they follow Jesus’ direction, filling large, empty jars with water, and then taking a small serving to the head waiter, that they find the wonder that has been performed. Here, though, having has passed through the process of committal to God, action has been transformed into obedience. Without this element, responses to evil may be well-intentioned. They may be courageous and creatively nonviolent. They may even have some effect. But they will ultimately be an exercise in pelagianism—and in exhaustion. They are not Mary’s way. In a recent post, I asked about a third way between “fight” and “flight.” Is it possible to respond to violence in a way that chooses neither of these? Mary, I suggested, shows us a way, but we must begin with a tradition that precedes her. We begin as she herself began, in the way of the wise women, the mothers, of Israel. Here, there is a great deal to consider. We could spend many hours telling each other the stories of Sarah and Rebekah, of Leah and Rachel. We could recall Miriam and Esther and Deborah, and dozens of others, named and unnamed. Although “systematic theologians” don’t often say so, a whole world of anthropological and moral theological reflection is waiting in their stories. For now, consider just one: Jochebed. If her name isn’t familiar to you, her position will be. She is Moses’ mother. And if you know her only by that relation, that’s not really surprising. In the first chapters of Exodus, where she appears, she’s not the primary character, nor powerful. Indeed, she has nothing, it would seem, to resist the overwhelming act of violence that she faces. Pharaoh—who has grown fearful that his Hebrew slaves, increasing in number, may turn on him—has ordered the death of every boy born to them. He first instructs the Hebrew midwives to kill any boy at birth, and then, to be sure, gives orders to his own people that any such child, if discovered, must be thrown into the Nile. What can Jochebed, an enslaved Hebrew mother to a baby boy, possibly do? Moses in his Mother’s Arms, Simeon Solomon (1840–1905). Because “she could hide him no longer,” the text tells us, she acts, in a decision full of vulnerability and hope. She will leave him very much in the open, “among the reeds on the bank of the river.” The irony is clear. Technically, she has followed that command that the boy must go “in the river.” A conspiracy, though, has thus been set in motion. Jochebed gives her permission for her daughter Miriam to stay and watch. And now, another crucial character, the daughter of Pharaoh, appears. Is this only a coincidence? Or does Jochebed know that she will appear just at that time? If so, Moses’ mother has engaged in a courageous gamble, specifically hoping that the daughter of Pharaoh will become her co-conspirator. The child is crying when the daughter of Pharoah finds him, and her first reaction is one of compassion. Yet, immediately this compassion is challenged by a realization. “This must be one of the Hebrews’ children,” she says. We’re not told how she knows this, but the implication is clear: action on behalf of this child will constitute direct disobedience to the command issued by her father, the Pharaoh. Again, in a twist, she takes responsibility for this child precisely in the act of sending him back to his first mother. It is not entirely clear what she knows about the “nurse” to whom she sends the child, but Pharaoh’s daughter certainly knows the woman is a Hebrew, and in her payment of wages, she thus also makes this Hebrew woman aware of her illicit intent to mother the boy, widening the risk she is taking. Later, when the boy is weaned and returned to his adoptive mother, we see Jochebed, too, acting in a new and deeper form of vulnerability. At that point, she delivers her son knowingly, consciously entrusting her son to Pharoah’s daughter, and sending him, in fact, into the very household that threatened his life. One biblical scholar puts it this way: “The series of divine/human acts that accomplish the exodus does not begin with the call of Moses or with spectacular, violent trial of strength that occurs in the plague sequence, but with the solidarity of the women in preserving life and resisting death.”* The work of God—the work of resistance and liberation, we might say—begins earlier and more quietly than we have suspected. All of this, as we shall see, assists us to begin to understand the way of Mary, mother of the “new Moses,” and instructs us, if we, too, would “arise a mother in Israel” and follow this wise way. *Francis Watson, in a work that I have lost track of and am waiting for a helpful co-conspirator to identify for us all.